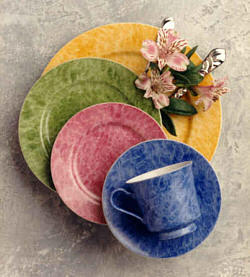 Alice Patchwork, with it's bright pastels, brings a light whimsical romance to the table. 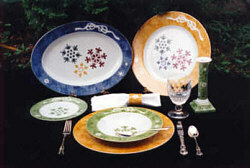 Our designs were chosen to create a unique and appealing table service. Fourteen individual patterns used in ever changing combinations, unite to create a truly new form of "TableArt". Royal Patchwork, using the same patterns as Alice Patchwork, creates a sophisticated look with it's deep jewel tone color scheme. 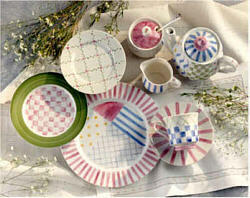 Our Prints collection coordinates perfectly with our Patchwork pattern pieces to lend an individual air to the table. Choose between eight colors in both a solid or a banded design. That makes sixteen choices! Multiply that by all the different combinations you can create and your table will never be the same. Alice colors include blue, rose, green and yellow. Royal colors include sapphire, amethyst, emerald and topaz. 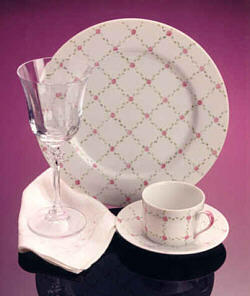 Rose Lattice has been created for you in both the Alice and Royal color schemes to set just the right mood. This pattern made such a hit as the Patchwork bread and butter plate, that we made it into it's own elegant dinnerware complete with all of the serving pieces! 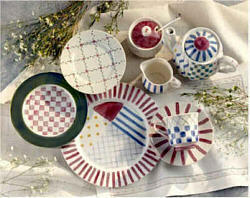 Create your own unique service by mixing in a few Patchwork and Prints pieces for a stunning TableArt presentation. French Blues is our perfect answer to your French country decor. The epitome of elegance is achieved on a crisp white background. Deep ink blue patterns frame our wild flowers detailed in bright yellows, soft blues and garden greens. Snow Prints is our special holiday collection. 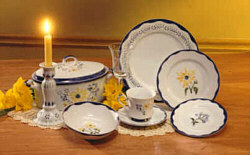 With it's delightful snow flakes and bows, this pattern will get you through the whole winter months of entertaining. Snow Prints coordinates beautifully with both the Prints and Patchwork collections and is offered in both the Alice (Blue, Rose, Green and Yellow) and the Royal color schemes (Sapphire, Amethyst, Emerald and Topaz).